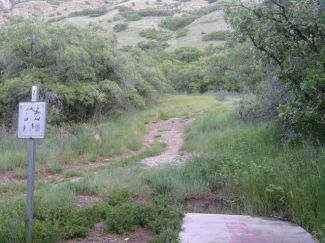 Description: Plays on the benches of the Wasatch Front Mountains, at the mouth of Rock Canyon above BYU. Very hilly terrain, NOT FOR BEGINNERS. 10 holes with concrete tees. Local Directions: From I-15, exit # 272 (University Pky), east 3 miles to a left on 2230 North, 1.1 miles to North Temple Dr., 0.4 miles to a left on Iroquois, 300 yards to a right on 2620 North, 100 yards veer right into Rock Canyon Park, 1st left into small parking lot. 1st tee plays uphill.